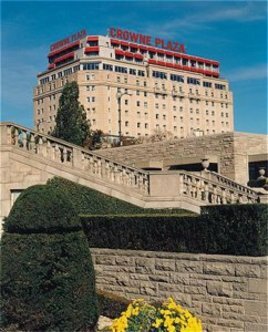 The newly renovated Grand Classic Crowne Plaza Niagara Falls-Fallsview hotel has been accommodating guests and celebrities for over 80 years, which offers old world elegance with new world amenities. The Crowne Plaza Hotel is located directly across from the majestic Niagara Falls in the heart of Niagara's tourist district, on the Falls Avenue Entertainment Complex. This 234 guestroom hotel offers breathtaking Falls views from many of it&regs rooms and also from the Fallsview Rainbow Room Restaurant located on the 10th floor of the hotel. The Crowne Plaza Hotel offers an indoor pool, Jacuzzi and sauna along with a new fitness facility. From the hotel lobby is guests can access the shopping concourse which features gift shops, the Always Refreshing Coke-Cola Shop and the Hershey Store. Located on the Falls Avenue Entertainment Complex, the Crowne Plaza Niagara Falls-Fallsivew hotel offers indoor connections to Niagara&regs newest and largest indoor waterpark, the Fallsview Indoor Waterpark and also to the newly renovated Casino Niagara. In addition to these attractions, Crowne Plaza Niagara Falls hotel has indoor access to Adventure City, MGM Studio Plaza, 4-D Movies and WWE Niagara Falls. Many themed restaurants are located on the complex including Hard Rock Cafe Niagara Falls and Planet Hollywood and the Rainforest Cafe Niagara Falls.